Table of estimated turkey cooking times at bottom of page. When cooking with a smoker, start with clean equipment. Place the smoker in an area shielded from winds to maintain a safe cooking temperature. If desired, add water-soaked hardwood or fruitwood, in the form of chunks or chips, to add flavor to the turkey. Do notuse a softwood (pine, fir, cedar, or spruce) as it gives the food a turpentine flavor and coats it with a black pitch or resin. Cooking a frozen turkey in the microwave is not recommended because it can cook unevenly and might not reach a safe internal temperature throughout. The turkey may, however, be thawed (using the defrost setting) in the microwave. Cook the turkeyimmediately after thawing. Turkeys can be successfully cooked in a microwave oven—whole or in parts. 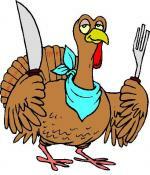 Turkey parts can be cooked in a dish with a lid, or cover the dish with plastic wrap and vent the top. Timing can vary because of wattage differences, so follow the recommendations in the owner's manual. A 12- to 14- pound turkey is the maximum size most microwaves can accommodate. Microwaves sometimes cook a whole turkey unevenly, so microwaving it in an oven cooking bag aids in even heat distribution. Microwaving a stuffed turkey is notrecommended. The stuffing may not be cooked to the proper internal temperature when the turkey itself is done. Cook the stuffing in a separate casserole. Estimated turkey cooking times for different cooking methods.